HINDU RITUALS AND ROUTINES...: !! SIDDHIVINAYAK VRAT !! MEANING: "O Lord Vinayaka! the remover of all obstacles, the son of Lord Shiva, with a form which is very short, with mouse as Thy vehicle, with sweet pudding in hand, with wide ears and long hanging trunk, I prostrate at Thy lotus-like Feet!" Sri Ganeshchaturthi is not only a festival but also a religious festival and a vrat. Siddhi Vinayaka Vrat is performed or observed on Ganesh Chaturthi day itself. 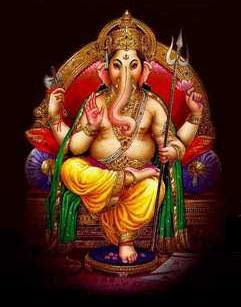 On this day Ganesha is prayed and worshipped according to the scriptures. 21 malpuas are offered to Ganeshji along with 21 Durvas (a type of grass) and 21 modaks while reciting 21 names of Ganeshji. After that one should offer food to the Brahmins and then should partake food. Ganesha is the Deity of “Light”. He is Himself “Light”. So for the Scientific minded, we worship Ganesha who is “Light Deified” on this day. Ganesha was born from the dirt on the body of Shakti. While Shiva is the “being” aspect of that which has come into being and which we call “Shrusti” or “Creation”. Shakti is the “happening” aspect of the same. It is the primary “Energy” which brings into being all that was, is and will be. The awakened Shakti is the stillness of Shiva that has become active or un-still. This first unstill-ness is the “vibration” or the AUM. From this Nada Bindu emerges the first aspect of Creation, that is LIGHT which even though is the finest form of energy, is still coarser than Shakti . (This LIGHT is not the Light that we generally know of. It is the LIGHT that gives Light, its Light.) This is why another name for Ganesha is OMKARA. And this is why Ganesha is said to have been created from the scurf of Shakti’s body. It could also mean that Ganesha is the first in the movement from a state of “Stasis”,or “Achalana” or Sattva, when no Creation is possible, to the state of “Chalana” or disturbance which produces Rajas and Tamas , which are the two aspects of Creation. Why is this Vrata called Varasiddhi Vinaayaka Vratha ?? 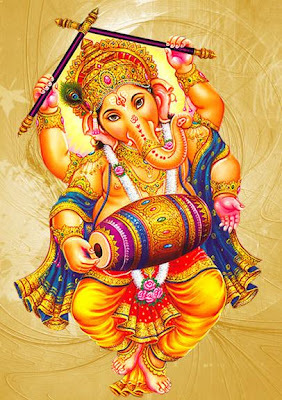 As per Ganesha Purana, this Vrata is observed and the devotees have to imagine that he is granting us all types of boons and granting our wishes. 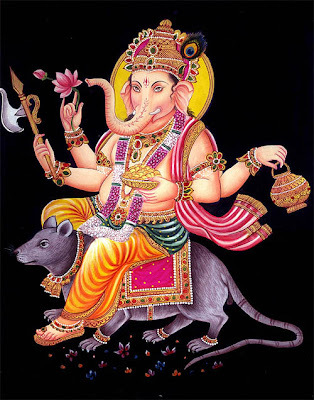 Ganesha is Varasiddhi Vinaayaka…. He is the one who fulfills any of our wishes…..removes all obstacles. What is Doorva Ganapathi ? Every pooja has to start of with first prayers to Ganesha. Even while performing Varasidhhi Vinaayaka Vratha we should request Ganesha to help us perform his vrata without any vignaas (obstacles). For this purpose, before the Ganesha Vratha, we keep this Doorva Ganesha (made of Cow dung and Doorva) and do first pooja to DoorvaGanapathi. What is the significance of Doorva on this day ? Ganapathi is also called Doorva bilva priya and likes Doorva. Doorva is considered as one form of samith during any yagna types. Hence Doorva finds a place during Ganapathi pooja. Three hundred sixty different frequencies are continuously in motion in the eight directions. The raja frequencies among them are called ‘tiryak’ frequencies and the tama frequencies ‘visphutit’. These clusters of frequencies adversely affect the world of living beings. Sri Ganesh ji controls these clusters and destroys the obstacles. Hence Sri Ganesh ji is called ‘Vighnaharta’, that is, the remover of obstacles. Before commencing the ritualistic worship, rice (grain) is spread over the seat on which the idol is to be installed. Either a fistful or a mound of rice is used, depending on the local custom. On invocation of Ganapati and His ritualistic worship, energy is generated in the idol. This energy saturates the rice on which the idol is placed. If there are two strings of a musical instrument (a stringed musical instrument) of the same frequency, when sound is generated by one the same is generated by the other. Similarly, when frequencies of energy are generated in the rice below the idol, this energy is transmitted to the rice stored in the house. Thus one can eat rice saturated with energy as a sacrament of food (prasad) throughout the year. When performing each of the following rituals a particular mantra is recited. 1. Sipping water from the palm (achaman): This brings about internal purification. 2. The resolve (sankalpa): It may be difficult to obtain the benefit of a ritual without making a resolve. 3. Purification of the seat (asanshuddhi): This is brought about by touching one's seat and offering obeisance (namaskar). 4. Chanting the Purushsukta (Purushsukta nyas): Amidst chanting of the Purushsukta, the deity should be invoked in one's heart, head, small portion of hair on the head (shikha), face, eyes and between the eyebrows. This facilitates an increase in the sattvik (sattva predominant) temperament. 5. Worship of the pot (kalashpuja): All deities, seas, holy rivers, etc., should be invoked in the pot. Sandalwood paste (gandha), consecrated rice (akshata) and flowers should be offered to the pot. This sattvik water is then used in the ritualistic worship. 6. Worship of the conch (shankhapuja): The conch should be washed and filled with water. Then sandalwood paste and white flowers should be offered to it. One should not offer consecrated rice and tulsi leaves to it. 7. Worship of the bell (ghantapuja): One should create sound by ringing the bell to welcome the deities and drive off the demons (asurs). The bell should be placed to one's left and sandalwood paste, consecrated rice and flowers should be offered to it. 8. Worship of the lamp (dipapuja): Sandalwood paste and flowers are offered to the lamp. 9. Purification (pavitrikaran): The water from the conch should be poured onto one's right palm and then sprinkled over oneself and on the substances to be used in the ritualistic worship. 10. Worship of the entrance (dvarpuja): Flowers and consecrated rice should be scattered in all four directions. This itself is the worship of the guardian deities of the directions (dikpal). 11. Consecration of the idol (pranpratistha): One should place the right hand over the heart of the idol of the deity and chant a mantra. Consecration of an idol is done at Ganesh chaturthi or to activate any new idol. This is not included in the usual ritualistic worship, as due to the regular worship the God principle has already been attained by it. 12. Meditation (dhyan): One should chant 'Vakratunda mahakaya suryakoti samaprabha Nirvighnam kurume deva sarva Karyeshu Sarvada. The number 21 signifies – the five organs of perception, five organs of action, five vital airs (pranas), five elements, and the mind. While performing Ganesha Puja at home, you can always be flexible. The strict rituals are meant for Vedic priests. All you need be careful is to perform the pujas with a clean body and clean mind. What is more important is devotion not the ritual. What is the need for a new idol? Inspite of having an idol of Ganapati, which is routinely worshiped, a new idol is brought for Ganesha Chaturthi. During the period of Ganesha Chatuthi, the Ganesha frequencies reach the earth in larger quantities. If these frequencies are invoked in the usual idol of worship, then that idol will acquire a tremendous amount of energy. To worship such an idol meticulously observing all the norms of ritualistic worship throughout the year would be a difficult task as one would have to follow the restrictions of ritualistic worship (karmakanda). Hence, a new idol is installed to invoke the Ganesha frequencies and is then immersed. The proportion of sattva, raja and tama components in Ganapati frequencies is 5:5:5 while that in an average person is 1:3:5. This makes it difficult for an average person to receive Ganesha frequencies for a long time. One should prepare the Ganesh idol from china clay or mud. Nowadays, idols are made from plaster of Paris so that they become light weight and more attractive. There is a difference between idols made from mud and plaster of Paris. There are references in the Purans (mythological texts) that Ganapati was created from grime. 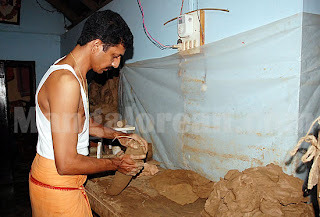 Hence it is appropriate to use a Ganesh idol made of mud for ritualistic worship. 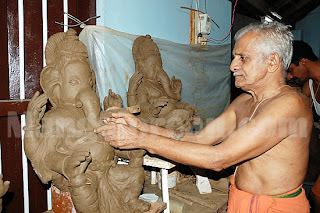 The pure spiritual particles (pavitraks) of Ganapati get attracted to a greater extent towards an idol made of mud than to that made of plaster of Paris. 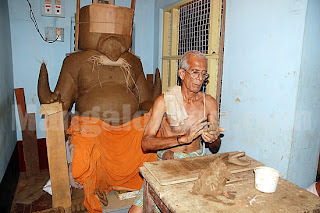 Nowadays, idol making houses have taken the form of a vocation to earn money rather than considering it to be a holy mission or art. The Ganesh idols are made using a mould so that they can be made available for sale faster, merely keeping a commercial angle. However as far as possible, a readymade mould should not be used. The reasons for this are as follows. When making the idol manually, idol makers get an excellent opportunity to exhibit their artistic skill and consequently they obtain satisfaction. Besides, sculpting the idol generates more spiritual emotion (bhav) in the sculptor and such an idol is more sattvik (sattva predominant). From a sculptor's viewpoint, the amount of spiritual emotion generated when sculpting the idol is more important than making the idol artistic and attractive. Hence as far as possible idol makers should make idols manually. Sanatan's perspective too is 'Art for God realisation and not merely art for the sake of art or as business'. If a guest pays a visit, we offer him a seat and not keep him standing. During Ganesh Chaturthi, we invoke Lord Ganapati, that is invite Him. One should offer Him a seat and proper hospitality. Harbouring the spiritual emotion (bhav) that Lord Ganapati has actually come to visit us. Besides due to the entire weight of the idol resting on the feet, the idol may even break if it is kept in the standing position for ten consecutive days. Hence one should make an idol which is seated on a wooden seat (pat). Get daily suggestions and instructions for earning $1,000s per day ONLINE totally FREE.